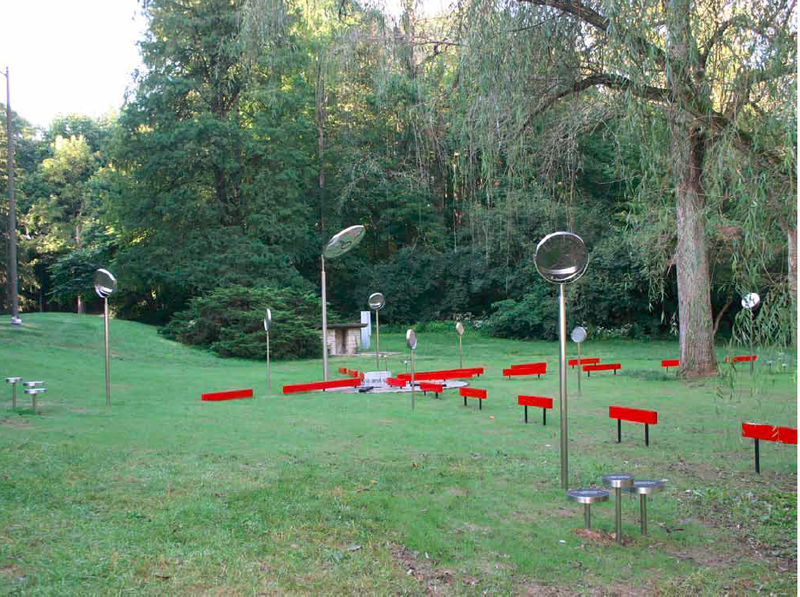 For the FLOW installation, 100 melon-sized bright red map pins were placed in the landscape. At some distance away from each pin, along paths in parks and by the river, mirrors stood at eye level on which were etched a red dot and the name of a water-related feature such as wetland, flood plain, flood gauge, storm sewer outfall or waste treatment plant. When you turned the mirror so the dot on the mirror aligned with the map pin say 30 or 100 feet away, then the feature in question, which might be quite a bit farther away, such as on the other side of a stream or pond, appeared in the mirror aligned with these two markers (see photo). 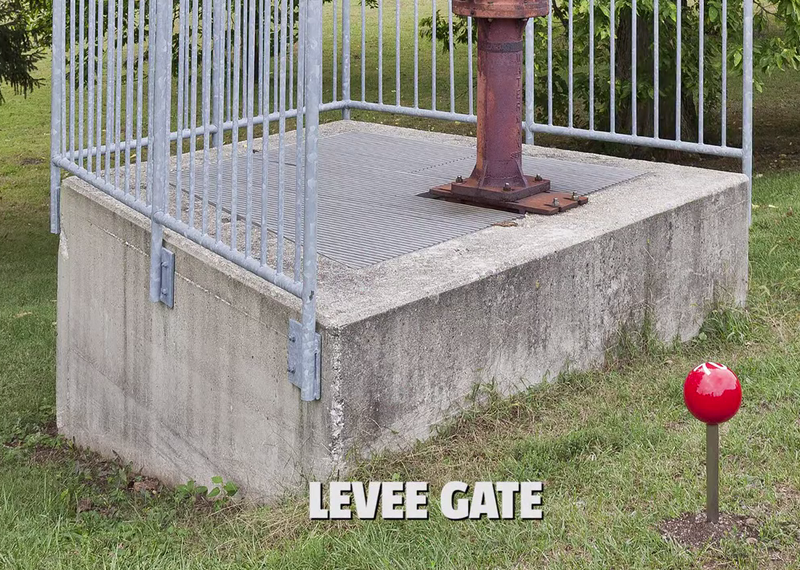 This allowed for marking features where it was not possible to place one of the oversize pins, such as in a wetland or on a dam. Also etched on the mirror was a phone number to call for a description of the feature. Additional etched glass and mirror structures had informational text and a map of all the sites. 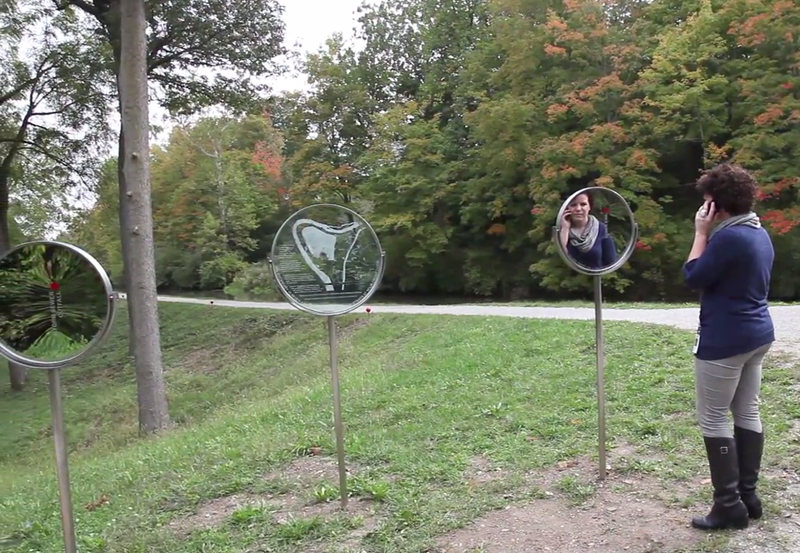 How the mirrors and map pins worked to physically engage the viewer. 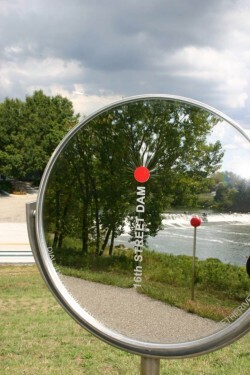 When you line up the dot on the mirror with the map pin, the feature in question – in this case a dam – will be aligned with them in the mirror. The creator was none other than Mary Miss (her given name), who has been one of the major pioneers in site-specific, land, and public art since the 1970s, frequently blurring the boundaries between art, landscape architecture, engineering, and education. But those terms don’t do justice because her works involve more fun and physical engagement and mystery than they imply. Every New Yorker has seen her work thousands of times – the enigmatic bright red metal bars and narrow apertures with half-hidden mirrors and texts scattered, apparently irregularly, in the 14th Street subway station, are her Framing Union Square (1999-2000). They frame traces of the station from before its modernization, such as mosaics, rivets, and wiring, or mark where elements used to be. She also was the lead artist for the distinctive plaza and promenade at Battery Park City called South Cove (1984), which to this day is said to be the point in Manhattan with the closest pedestrian access to the water and I can testify has aged better than most landscape architecture from that time. For some time her outdoor work has been focused on public engagement and done under the umbrella title of City as Living Laboratory. 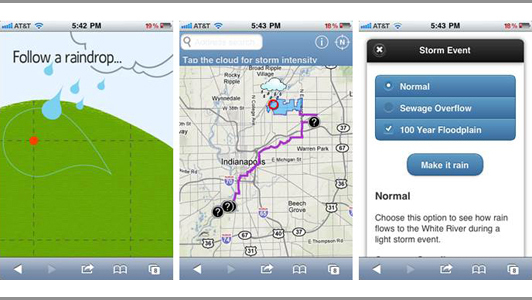 Equally exciting was the phone application called Track a Raindrop. 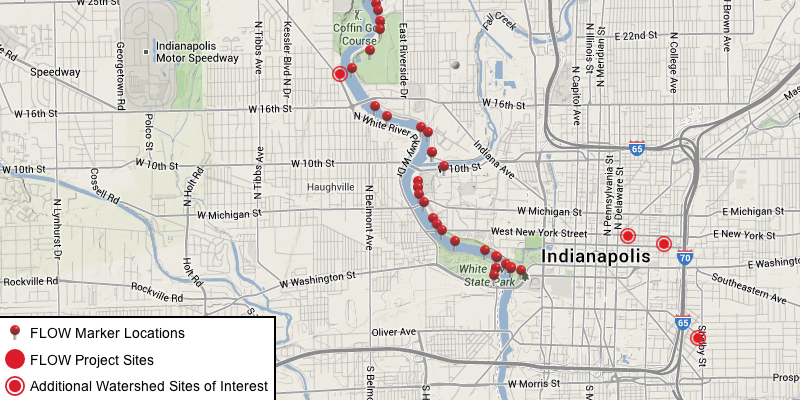 You clicked on any point on a map of Indianapolis and it showed you the path that every raindrop falling on that point will follow – along the street, into a storm drain if there is one, from there to a stream and eventually into a river and I assume eventually the Gulf of Mexico. I don’t know for sure because the app has disappeared from the internet just like documentation of the rest of the project. Most people don’t realize that every point on the earth is in a watershed and all watersheds drain into rivers. This was a great way to show them. 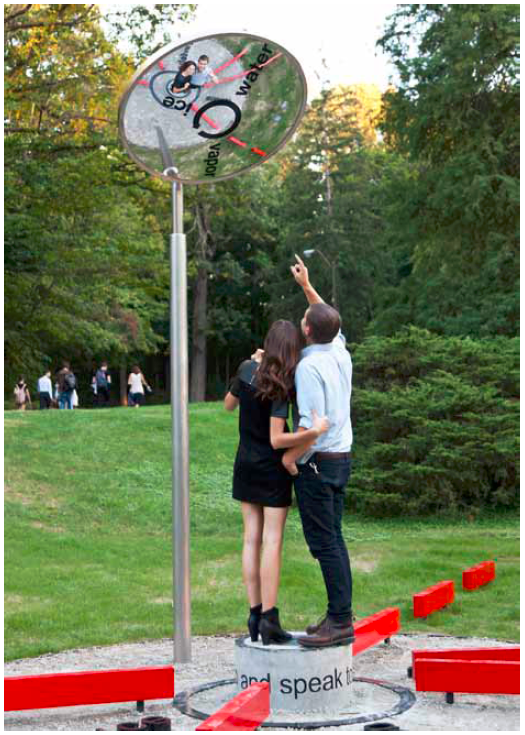 In 2015, a second project called StreamLines was created with fewer installations and more arts performances. 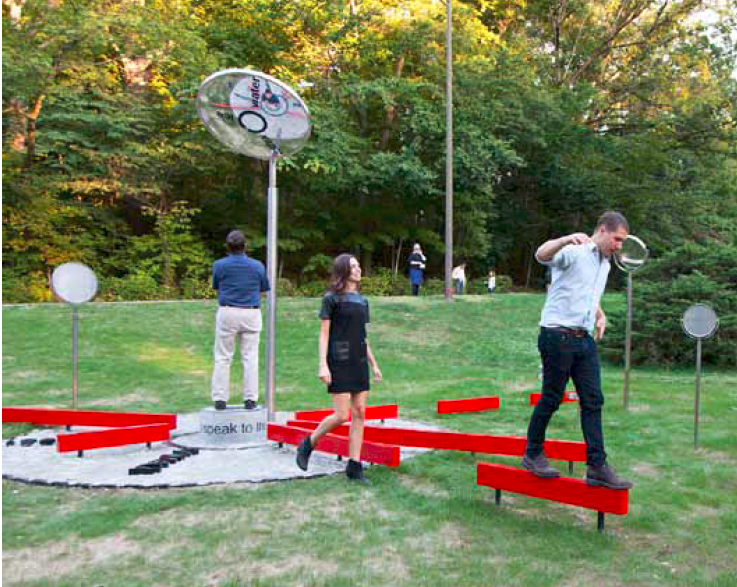 With only 5 installations, the idea seems to have been to have more for people to do at each site than at the earlier mirrors that each focused on one feature only. 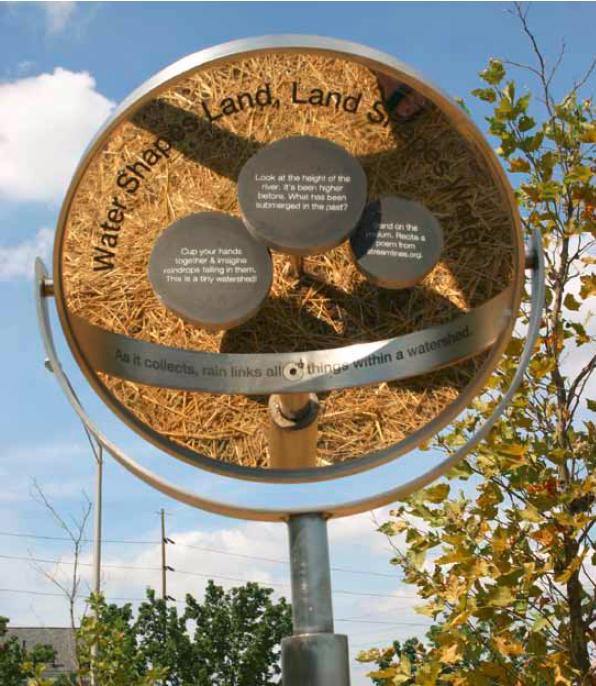 Each StreamLines site had a platform where a person could stand and look up into a mirror and see text about local water features and systems etched on the mirror and in reflections of structures on the ground, with red balance beams radiating outwards from this point. Other mirrors and signs displayed not just information but prompts for play and physical engagement and exploration: “Listen for birds. When you hear one call, call back. Travel between the warmest and coolest spots on this site. Discuss: how many times do you cross over a body of water each day? Tell a joke from streamlines.org”. Between the striking red beams and prompts for actions, I can see StreamLines engaging families and other groups more than FLOW did. StreamLines also had a more extensive program of dance, music and poetry directly related to the water themes. The installations were in place for a year or two, by intention, because maintenance to repair the effects of wear and tear, weather and vandalism would have been too expensive. But the lack of enduring and publicly available documentation is a disappointment. It took me weeks of exhaustive digging online just to come up with what you are reading here, detective work, combing through the Internet Archive which saves copies of websites that have been taken down. For our non-American readers it’s important to point out that although Indiana is indeed deep Republican country – Vice-President Mike Pence was the governor – its level of both culture and environmental awareness can be as sophisticated and progressive as on the coasts, and this is true of cities in every state, regardless how Red they are. In terms of quantity these things may offset by the bible-thumpers and guns and racism but they are there. Having lived in both hinterlands and metropolises I can assure you they hold their own against what you find in so-called cosmopolitan centers. That leads us to the sad story of the Instagramification of the Indianapolis Art Museum, a grand and well-funded institution with an excellent, encyclopedic collection. Although Indianapolis is the 33rd largest city in the U.S., its museum has the eighth largest endowment and eighth largest main building. It gets more visitors than the Frick in New York or the Cleveland Art Museum which has twice the endowment and is a major world-class museum (check the labels in the Metropolitan or the great European museums – loans from Cleveland are not uncommon), unlike Indianapolis’ which is perhaps one tier down, or a half-tier, but still excellent. It lies adjacent to the estate of its primary benefactors, the Lilly pharmaceutical family, who also donated the estate’s house and grounds, now registered landmarks, to the museum in 1966. In 2002 the same Lilly heiress gave $200 million to the Poetry Foundation (yes, $200 million). 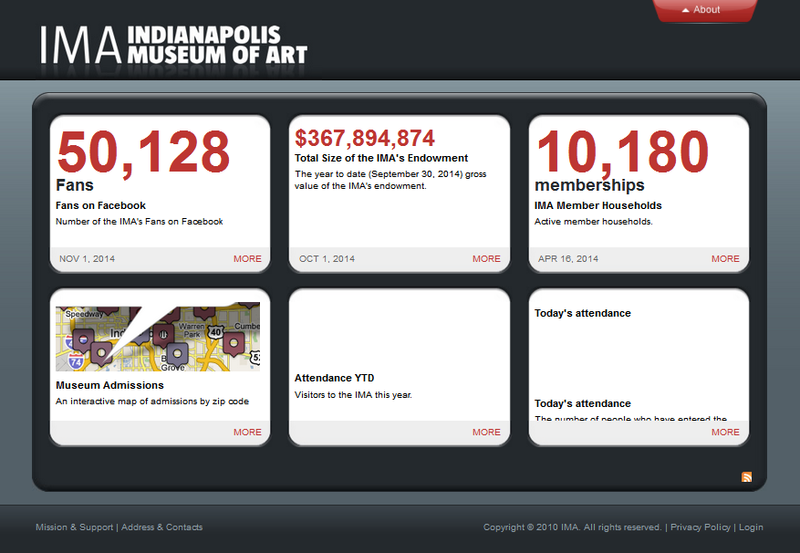 The museum had a reputation for innovative, challenging exhibits and early engagement with the digital realm such as its revolutionary “Dashboard” website, now gone like the Miss documentation, that reported hard behind-the-scenes numbers such as size of the endowment and numbers of visitors with a map showing their home zip codes. Now-deleted Dashboard site saved at the Internet Archive. Dashboard appears to have been shut down in 2016. But after an over-ambitious expansion program in the early 2000s led to financial troubles – attendance has stalled at half the number that was predicted – the museum fired its director and hired a new one whose massive restructuring and rebranding scandalized the art world. Around 2012, twenty-nine staff positions were eliminated, a staggering number for a museum, including seven out of the museum’s twelve curators and the director of publications. The museum refused to say which positions were gone. Admission went from free to eighteen dollars, the internship program was eliminated and the library ceased having regular hours and is now open only by appointment. An exhibit of cars was held. And that was before the “travesty” really got underway. It seems the museum solved the worst of its financial issues shortly after these dramatic changes, but still the director and trustees went farther and carried out a tectonic shift in the museum’s identity and its role in the city’s or even the country’s culture. In the restructuring, the name Indianapolis Art Museum itself was retired and the museum repositioned as just one amenity among many in a multipurpose site christened Newfields, which encompasses several entities that have always been directly adjacent to the museum and institutionally linked to it, either formally or informally: a critically acclaimed 100 acre sculpture park opened in 2010, beer garden, and Oldfields, the aforementioned Lilly house and gardens (hence the neologism), and more. From the Newfields website I thought it was some sort of shopping mall, or resort, that was trying to be classy and make it look like they’re not a shopping mall and offered art tours of local sites. It took 20-odd minutes of digging around to figure out what on earth they were talking about and whether this really was the Indianapolis Art Museum or not. Now, the museum is lost in an onslaught of lowest-common-denominator, pandering, Instagram-targeted “experiences” and this is where great art and culture go to die in a tar pit of focus-grouped marketing-speak. “Do & See”, “Shop & Eat”, hawks the website. Yoga, crafts, book club, Saturday morning “cereal and a movie”. Relentless exhortations to “explore” and “experience” with the latter word repeated so often it’s creepy and you wonder if they’re trying to hypnotize you into coming. “A place for kite-flying, cloud-gazing, memory-making, new-idea-having”. “A mansion to stage unforgettable events, restaurants for relaxing, bars for microbrews and friendships.” One wonders how many hundreds of thousands of dollars went to marketing consultants just to come up with those twenty-one words alone. The flagship showstopper event of the season is… Christmas lights. Oh but not just any Christmas lights, these are “Winterlights”: “see the lights dance again as you amble side by side with family and friends”, because oh is that what Christmas lights are for? thanks for the tip, now I don’t have to ask Alexa, and because apparently the trustees can’t get enough of some marketer’s insistence that millenials and young families like it when you put two words together to make a new one. “Cheap midwestern boardwalk” as the Atlantic‘s City Lab put it, accurate in mood if not geography, given that only seashores have boardwalks. The director was quoted as saying he can’t understand why the museum shouldn’t get as many visitors as the city’s runaway successful children’s museum, which sounds like something from the Fox News School of Art Criticism, and started a Facebook page just for his 20-room house where he shared his redecorating plans and thoughts about evaluating party caterers. The media and art world howled, mocked, and heaped deserved scorn on the sad and vulgar degradation. Naturally the art is still there in the museum. 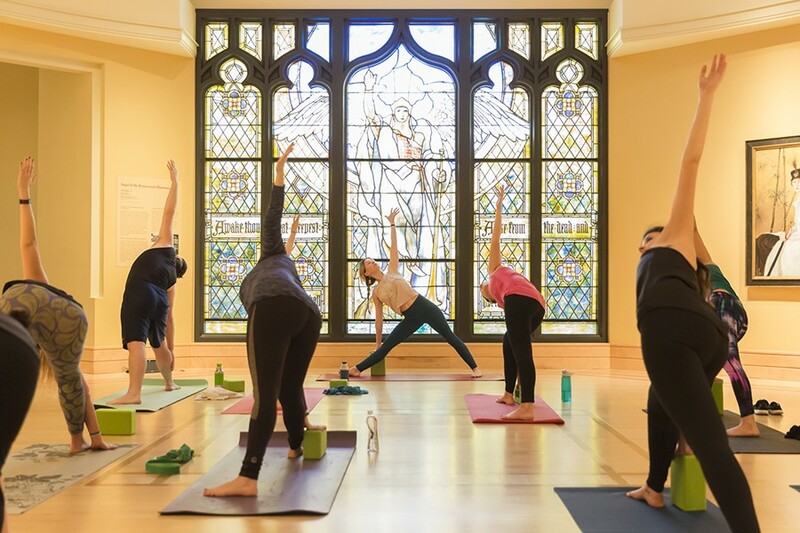 There are collection tours, though they are jumbled haphazardly in amongst the listings with Instagram-style photos of Christmas wreath making and young women doing yoga. There’s a George Platt Lynes exhibit, which seems to have the challenging spirit of the “old” museum. For now, it still has its first-ever-worldwide online database of deaccessioned works, begun in the 2000s, where you can see which works the museum sold off from its collection and when and in most cases why. Deaccessioning is extremely controversial and secretive in the museum world, and, I am told, just plain prohibited by law in France and Germany. It can turn museums into profit-driven speculators and indicate incompetence in choosing important works that are worth having, and can send a discouraging message to donors that the museum could someday sell off their donations. Indianapolis’ great step towards transparency was a bold and rare move to show they only deaccession for very good reasons. Good luck finding the database, though, buried as it is in deep in the website, many labyrinthine clicks behind the yoga classes. 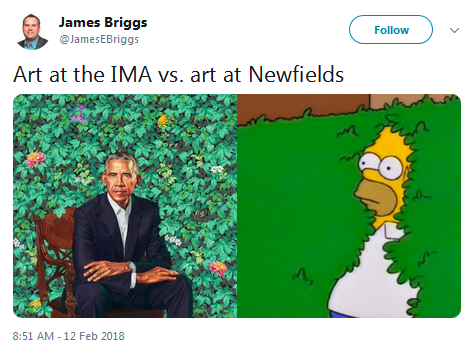 I never would have known it’s there if I hadn’t seen it mentioned in negative criticism of the museum’s rebranding, as an example of the kinds of things the IMA – pardon, Newfields – doesn’t do any more. Mary Miss isn’t in the website at all. In a talk about the FLOW project, she said one of her inspirations was Borges’ famous description of a map as big as the territory it describes, and elsewhere in the same talk she discusses river and watershed ecosystems. The FLOW website is archived here.